Stems: Ascending to erect, much-branched from base, not producing prostrate runners, hirsute with antrorsely curved hairs. Leaves: Basal and cauline, basal often withering early; basal blade spatulate to oblanceolate or linear, 2/5 to 3.2 inches long, 1/12 to 3/5 inch wide, margins usually entire, rarely obscurely serrate, surfaces sparsely strigose, eglandular; cauline gradually reduced above, base tapered. Inflorescences: Heads 1-15, radiate. Involucres turbinate to hemispheric, 1/8 to 1/5 inch tall, 1/4 to 2/5 inch wide. Phyllaries in 2-4 series, green, narrowly oblanceolate to linear, hispid, minutely glandular, apex erect. Flowers: Ray florets 20-70; corolla white, sometimes tinged lavender or light blue, ligule 1/6 to 1/3 inch. Disc corollas numerous, yellow, tubular, 1/12 to 1/8 inch, lobes 5. Fruits: Achenes oblong, flattened, 1/25 to 1/12 inch, sparsely strigose; pappus of outer series cartilaginous crowns, inner series 15-18 barbellate bristles. Habitat: Sand and sandsage prairies, sand dunes, sandy roadsides and pastures, flood plains. 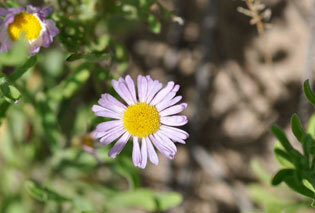 Comments: Erigeron, early or woolly + old man, perhaps alluding to the pappus or the solitary heads of some species.